The fully waterproof LOWA Mountain Boot Black GORE-TEX® and also available in the new army brown colour. Highly rated by both UK & US SF alike the LOWA Zephyr Boot fulfills the requirement for those operating in a lightweight role. A high performance, surprisingly lightweight boot for the discerning professional in the harshest environments and coldest of weather. The innovative, lightweight and multifunctional mid-cut Lowa Innox GTX® Mid TF is suitable for a wide variety of outdoor military activities from boot runs, exercise, camp use & guard duty. The Lowa Combat Boots GORE-TEX® are considered one of the best military, tactical and police boots on the market today. "As an ex light infantryman, the LOWA Z-8S GTX would’ve been my choice for long range patrols and bad weather operations..."
"....perfect comfort with no issues in the slightest. I put these boots on at 0200hrs on the morning of the competition with a single pair of issued socks. Took them off 39 hours later after covering the 63km.."
"..boots that feel like a trainer but provide support to the ankles. The sizing is “spot on” or “perfect”. The boots fit tightly and have minimal movement once laced correctly. These boots are extremely light which made running and tabbing in them a joy.."
The LOWA Zephyr GORE-TEX® is now available in a Coyote Tan, Desert, Black, MOD Brown & Coyote Op version for use with UCP, MTP or multicam coloured types of uniform and clothing. "....the Lowa Desert Elites provided exceptional support and comfort. I absolutely endorse and recommend the Desert Lowa Elites to any one in quest for a boot that can endure unforgiving environments..."
Task Force Distribution Limited are proud to be the UK importer and distributor of the LOWA Task Force Collection of military and emergency service boots. We stock and distribute a wide range of the LOWA Task Force military, emergency services & police boots. We also stock the LOWA certified work and safety boots for use by all emergency services personnel as well as workers in the construction industry. The Task Force website allows you to buy LOWA boots directly from us, as soon as they become available. We all know that the outdoors is a much more pleasant place with comfortable feet. LOWA produce some of the best military, police & emergency boots available today. Lowa boots are still manufactured in Europe from the very best materials. Our list of approved UK retailers can be found on our LOWA stockists page or if you want to become a retailer of the LOWA Task Force boots, contact Task Force. LOWA Footwear: The Place For All Your Military, Police, Combat and Tactical Needs. Welcome to Task Force Distribution, the UK home of LOWA military boots, tactical police boots and specialist safety boots. With our fantastic range of army inspired, protective and ultra hardwearing footwear, we promise you’ll find the perfect pair of LOWA boots for you. Originally founded in 1923 in the Bavarian village of Jetzendorf (near Munich, Germany) by the brilliant Lorenz Wagner, our LOWA military boots represent the pinnacle of true innovation and inspired design. Featuring everything from low ankle support, GORE-TEX linings, mid-height uppers and even reinforced carbon insoles, our fantastic range of specialist LOWA tactical boots are truly industry-leading. Perfect for outdoor activities such as hunting, camping, walking and hiking, our enduring, functional and high-quality LOWA boots will never let you down, especially when you need them most. With specialist military designs inspired by security forces, expedition teams, the military and police worldwide, the LOWA brand caters to varying and extreme demands with ease. 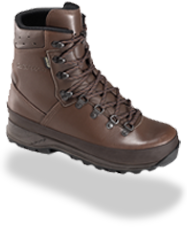 Whether you’re looking for LOWA military boots (such as our Desert and Mountain ranges), police patrol boots (such as our Ronan or Seeker classics ) or some practically indestructible safety boots (such as our Leandro or Innox models) we guarantee to have the perfect LOWA footwear for you, at a price you’ll love. And don’t forget that we’re also a one-stop shop for your entire LOWA accessory needs, with a huge collection of LOWA boot laces; shoe fresh and active cream & water stop solutions. So why not explore our Task Force Distribution store now and discover the joys of using LOWA boots for all of your needs, whether it’s for gruelling military reconnaissance, a tactical enforcement-policing role or some heavy-duty factory working. Best of all, every single pair of boots from the LOWA range include an unbeatable world-class 12 month warranty from the date of purchase, so you can rest assured that they are of the highest possible build and craftsmanship from the very first time you put them on. If you have any questions, queries or just need some advice regarding purchasing any of the LOWA boots in our store, then please don’t hesitate to contact us. We’ll happily provide you with recommendations, tips & tricks and complete advice regarding any of the police, military or safety boots in our expansive LOWA footwear collection.